It was Friday lunch time, and with an empty fridge at home, I was on the search for a wholesome, non costly takeaway bite to eat. 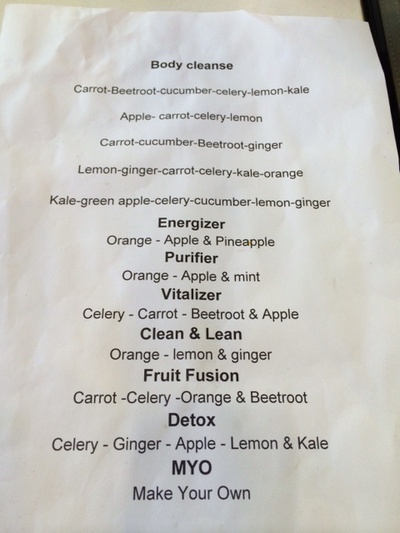 I found it at Israeli owned Chapter e Food and Juice Bar. Open for exactly one week and a day, this cafe serves a range of hot and cold middle eastern dishes fit for hungry workers, along with a broad selection of freshly squeezed juices. A friendly, open shop front. 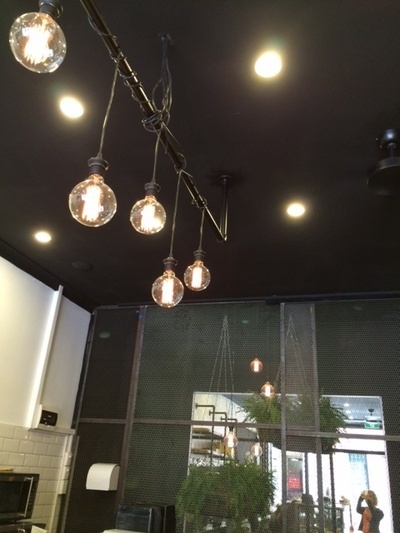 Owned and run by the same people who own the establishment next door, 3 Group Espresso; this cafe has a bright and airy feel with wooden detailing; exposed pendant lighting; a mirrored back wall; hanging plants, and food displayed canteen style in clear glass cabinets. On the counter sits a sample plate of home made hummus smothered in z'atar spices and olive oil just waiting for you to dip in a piece of pita bread. 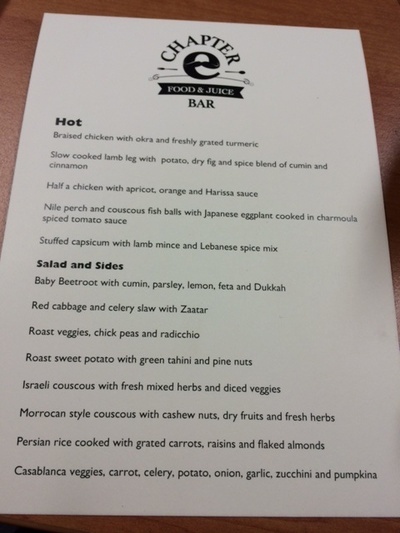 As the owner says, it's not quite as good as in Israel, but it's close. In Australia, where good hummus is hard to get, this is a real find. 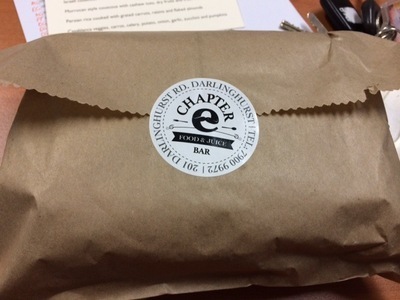 Chapter e is so new that no pricing structure has been established yet. 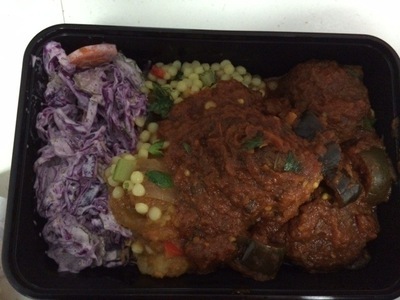 There are a few eat in tables, but their food is primarily sold in three takeaway sizes. At the moment, You are allowed to order as many of the different dishes as you can fit into your desired plastic container. I chose three dishes in a medium box and was charged $10. It was enough for two lunches. I found out just before paying that the generous owner gave me too much, so my food was packaged as a large, but I was still only charged for the medium. I thought that was really considerate. The food was great. It's warm, comforting, and the flavours are full and rich, just like a home cooked meal made by a loving, Jewish mother. I chose a salad, a grain and a meat dish. The red cabbage salad with celery and mayonnaise had great crunch and a delicate flavour. The Israeli couscous was tender, and the pearly grains were soft without being mushy, flavoured with chopped vegetables, and topped with a spicy capsicum sauce. The perch fish balls were served in a thick tomato, eggplant sauce. The balls were firm, and the fish flavour was quite prevalent and well complimented by the sauce. I have to say, this was my favourite of the three. It was such a unique and fun way to eat fish. With this shop barely on its feet, there are already plans for a second, with ideas for a new shop in the Vaucluse area. The product range in this shop is also set to expand. Shelves will soon be stocked with homemade jams made from exotic fruits such as figs, and large loaves of challah (plaited bread) will be sold. 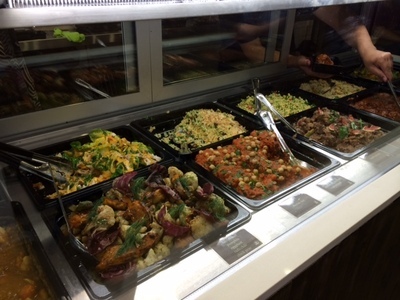 The range of salads and hot dishes will also expand. 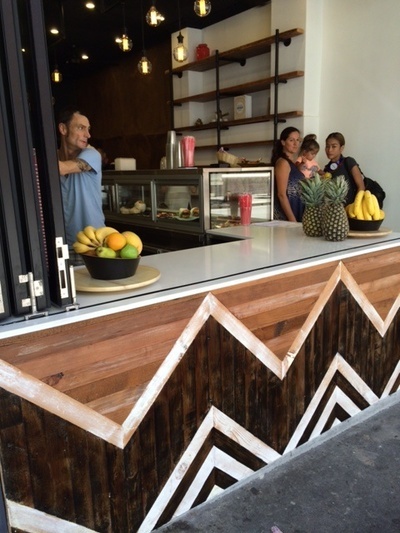 We think this might be Darlinghurst's newest cafe to watch. 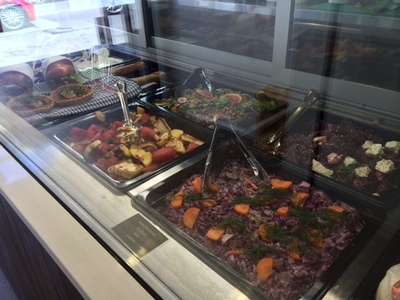 Why: Wholesome food and friendly owners. When: Breakfast and Lunch, Monday - Friday.